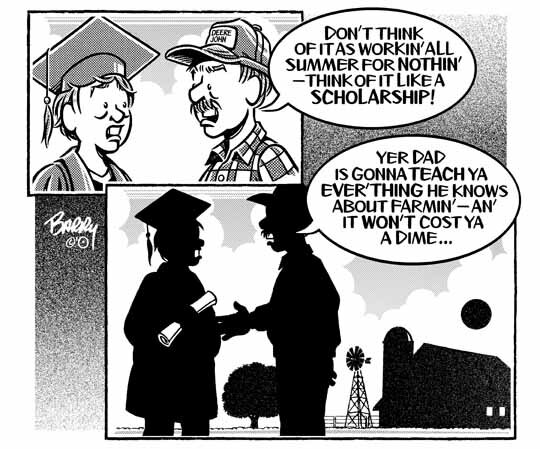 Here's my second GRADUATION cartoon for the day, this one leaning toward the AG end of things. Again, post-grad employment is the issue & once more "relativity" figures in — only, this time the focus is on cheap labor. And it doesn't get cheaper than enslaving the kids, eh? HA! Including three versions of this one: FARMING, RANCHING & [generic] BIZNESS. Hope I'm not overwhelming you guys with the number of cartoons I'm sending out regularly now — but, it seems to come with the Category-building territory. Besides, too many beats too few, eh? HA!